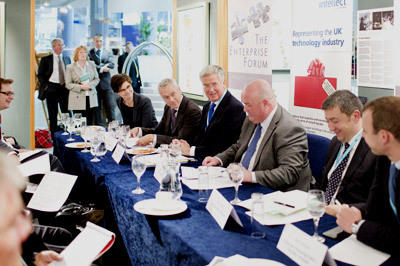 The Enterprise Forum has held events at Conservative Party Conference since 1997. The Enterprise Forum programme at Conference is composed of fringe events and also a Business Reception which usually takes place on the last evening. The Enterprise Forum does not take positions on policy. 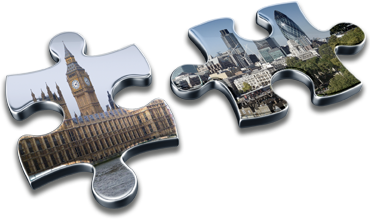 Therefore it lends itself well to providing a truly independent setting for the sponsor, where policy can be debated and views exchanged amongst Ministers or MPs, business representatives and other stakeholders. As a member benefit, sponsorship of Enterprise Forum events at Party Conference is at cost-price. The Forum organises all logistics and promotion for the event, and the sponsor has the opportunity to raise the profile of their organisation on a particular topic/issue. 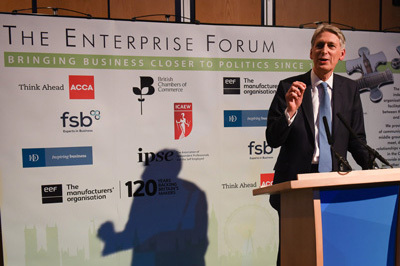 For more information about sponsoring an Enterprise Forum event at Conservative Party Conference please contact us. I'd like to thank The Enterprise Forum for partnering with the CBI for the business reception. We were particularly pleased with such a strong turnout and the Chancellor's involvement, and have some very positive feedback from our members. Getting all seven business groups to work together and then approach the Enterprise Forum for one single Conservative Party Conference Reception was incredibly effective. It became one of the most successful events of conference season, with guests including a number of foreign dignitaries to pack the room, and a set-piece speech from the new Chancellor - his first to a truly cross-business audience. Impact online beyond the conference was huge, with all business groups using their comms channels simultaneously. Well done Enterprise Forum! The Enterprise Forum's event far exceeded our expectations in delivering a genuinely policy-focused discussion relevant to industry. Head of Government Affairs, EEF the manufacturers’ organisation.